An unfinished house with not plastered walls and visible metal struts in the wall? How uncomfortable! Or not? The Industrial Style is currently experiencing a boom and is focusing on the things that make for a house that is not ready for occupation. The industrial home looks cool, yet cozy and romantic. 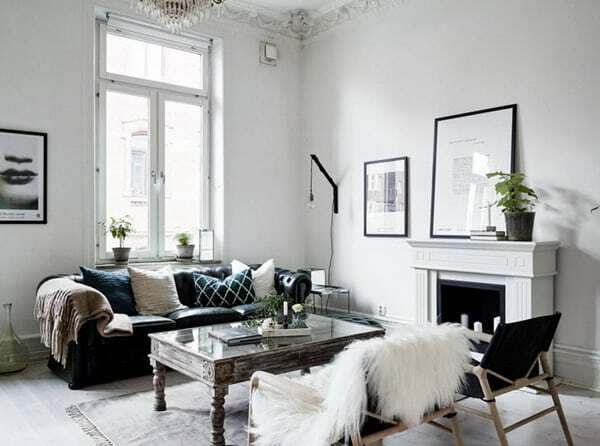 The industrial style is more masculine, so colors that are rather muted or dark are also used. Dark blue, steel gray, black or anthracite are the colors of choice. To loosen up the whole thing, dark red and wood are used, these basic tones provide coziness and balance. After all, despite the industrial design, the living room should not look like a workshop! The nice thing about it: Many colors fit in, red and yellow also look good and give the living room a little visual warmth. This does not mean materials that are actually heavy in the sense of “heavy weight”. Rather, it is about the use of concrete and metal, which have a heavy impact and stand for durability and robustness. Concrete vases, steel candle holders – all this ensures clean lines and a purist impression. Covered lampshades that may come in a bright pink? No, the Industrial Style makes the lighting very different and can provide a cozy atmosphere with the steel factory lamp. These lamps used to hang only over the workbenches and machines in halls, used to be cold halogen spotlights. Today, these lamps are more of a work of art, are perfectly combinable with other furnishings and harmonize with all furniture used in industrial design. Even without a lampshade, such lamps can find their place and put everything in the right light. Other people have a sofa or a “chaise longue” – we have industrial design and with it chairs and stools as seating. These bring no frills or unnecessary decorations in your house, are masculine and speak a very clear language of form. Even with these pieces of furniture, you should focus on the typical colors of industrial design and not replace these in favor of the cozy furniture in pink or green. Probably the most important feature of industrial design is that of living with bare walls. These give the room something cool, daring. If the room no longer has any rough walls, these can be carefully exposed. If you do not want to do that, simply apply different painting techniques or glue appropriate wallpaper that gives the impression of a non-plastered masonry. Every piece of furniture that finds its place in the living room or in the rest of the apartment in industrial design fulfills a clear purpose and is also to be viewed. Here it does not have to be considered whether the small chest of drawers is such or whether the indicated doors may not open at all. Flourishing and ornamentation does not need a person who has specialized in industrial design – after all, industrial goods do not attach much importance to simply looking beautiful. Certainly critics are right who claim that the industrial style would seem a bit archaic, crude and shabby. But it depends on the skill of the homeowner or on the homeowner, how cozy such an industrial housing in the end. So it’s a way to make metal look a little more homely by disguising it with fabrics. On hard chairs made of metal or untreated wood comes a soft pillow and already the furniture looks much more inviting. The trick is to give the whole thing a somewhat enchanted charm, to make everything look a bit magical. There are no limits to the joy of combo: For example, there is the option of using old canisters with product images as a flowerpot. Of course, these canisters should not look new, they must have a little patina attached. Only then does the style look real! Anyone who decides to use industrial design in their home must also demonstrate a high level of combination talent. Accessories are compulsory, otherwise the feeling of entering an office in a production hall when entering the apartment. Cushions with selected motifs and matching colors are a variant. Another is the cladding of the walls, if only partially. Hardly anyone will put the delicate pink floral wallpaper next to the raw wall with visible metal rails, but such a contrast can be a good eye-catcher, if it is placed in the right place. If you want to get new ideas in terms of combination possibilities, you should visit a furniture fair. 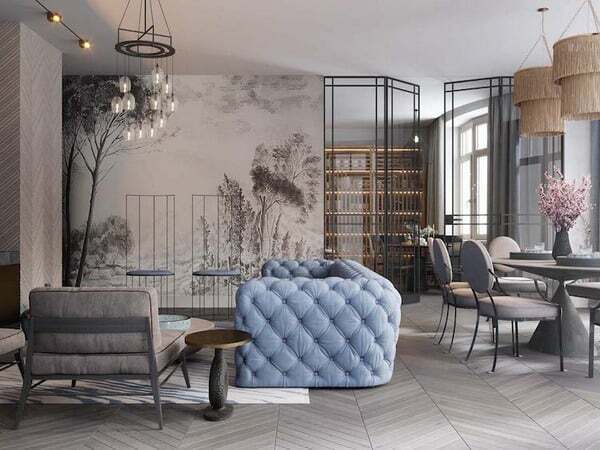 These take place regularly in different cities in the country and provide a good overview of the current market as well as the current fashion in terms of the furnishings of the apartment. In industrial design everything is allowed, what pleases – and what initially does not like, is a matter of habit! No, it’s not that bad. But who can imagine having the old workbench from the workshop in the house! This is just a good idea, because it makes a great dresser or can be used as a sideboard. Even lockers in exchange for the traditional cabinets are a good idea. If the current offers of furniture designers are too expensive, should inquire once in schools. There are always sales of lockers, which only have to be made “chic”. Who says that the books in the living room always have to be in a bookshelf? One possibility, which is more in line with industrial design, is the installation of metal shelves. These can be visually a little embellished, which is easily done by stickers or the like. Already an individual bookshelf is ready, which definitely has what it takes to be an eyecatcher in the living room. If a house is newly built, the floor is one of the most expensive things – underfloor heating, screed, tiles or carpet: Something adds up! But industrial design does not demand perfection, it rather focuses on the imperfect. The concrete floor may show cracks, wood should be covered by a patina. This looks especially authentic! Anyway, the entire floor should just look old and not finished as just. It is true that new floors are hardly treated in such a way that they look as if the primeval people had trudged over them. But who is only faced with the question of which flooring the house can be embellished should think twice. Reclaimed wood or smoked parquet wood turns out to be exceptionally good in an apartment that has been designed in industrial design. Linoleum is also doing well here, with many great and unusual designs are available. It is important that the floor is not completely smooth, but that it has visible signs of wear and structures. If the floor should look as if it were already old and had been used for many years, the same applies to the ceiling. This must not look in industrial design as if it were perfect! Rather, the ceiling should be exposed as far as possible, that is, that light pipes and cables are visible. Therefore, free the blanket from all its fairings if you want to integrate them meaningfully into the concept of industrial design. Especially with high ceilings, this offers and works very well. The pipes are made invisible by plastic channels? Then remove them! It is only allowed at the end of a cable loose dangling in the room, also a hazard must be excluded. If the ceiling is therefore not too high and you (curious) have small children in the house, you must make absolutely sure that loose cables or cables that are not plastered, under no circumstances are accessible to the children. Doors and dividers, which are built in a completely different style, give the room, which has already been decorated in industrial design, at best an unfinished impression. Nothing harmonizes here and the doors are the complete opposite of the furniture or the rest of the furnishings. If, on the other hand, they are made of steel and glass, this results in the typical industrial look. Ideally, this look is also included elsewhere in the home, thus ensuring a unity in the furnishings. When decorating the apartment in industrial design is that less is more. The materials used are limited to glass, wood and metal. The colors are gray and black, a few warm colors such as red or yellow may occur. The industrial style is puristic, stands for a Spartan furnishings and not for a sumptuous living. So do not decorate too much! The sofa does not have to be completely covered with blankets and pillows, the side table must not be made of teak. Everything can not be spent as a deliberate break in style! Just a few parts too much can disturb the overall impression and ensure that the Industrial Style is no longer such. If you want to set something up, then pay attention to the selection of accessories: Recycle bins made of tubular steel are okay, a large plant should also find itself in the room. A jungle must not be out of the room, so you should not set up too many plants. As with all accessories in the industrial style is true that they may be eye-catching, but may not distract from the actual furniture and design details. An eye catcher should be the factory lamp above the table, not the table itself or even the colorful cushions on the chair next to it!